Here at Hi-Desert Air we service the entire Morongo Basin with all their heating and cooling needs. Heating units, air conditioning systems, evaporative coolers, from installations to repairs, residential as well as commercial. We are Yucca Valley’s premier heating and cooling contractor. Reliable, honest, and efficient service, Hi-Desert Air will travel anywhere you need us to go. All technicians are factory trained and background checked, bestowing their professional service for the utmost client satisfaction. Offering their own steel metal shop and fully stocked parts department provides customers with all the HVAC materials necessary to fix any repair. Financing and maintenance agreements available, call for your free estimate today. 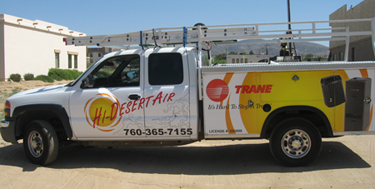 Hi-Desert Air, the established professionals working for you! ©2009. Hi-Desert Air. All Rights Reserved.